In an earlier post, I looked at the best rotations in the history of baseball according to the Baseball-Reference Wins Above Replacement (WAR) statistic. In order for a rotation to qualify, it needed four starting pitchers with at least 20 starts, 162 innings and two WAR. 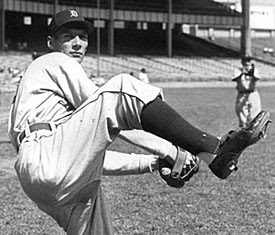 The 1946 Tigers rotation of Hal Newhouser, Dizzy Trout, Virgil Trucks and Fred Hutchinson finished second in total WAR trailing only the 1912 Red Sox. Now, I will concentrate on just the Tigers staffs. Only ten Detroit rotations met the above qualifying criteria, so the WAR cut-off will be relaxed from two to one. The top 12 rotations are listed in the table below. The table reveals that the 1940s was the ultimate pitching decade for the Tigers. If we include the 1950 season, six of the top ten staffs came from that one narrow time period. The 1940s pitchers showing up most often are the left-handed Newhouser and right-handed Hutchinson, Tout and Trucks, each appearing at least four times. Tommy Bridges also made the list four times spanning the 1930s and 1940s. The best four-man WAR totals came in 1946 (23.9) and 1949 (21.0) but the deepest staff was the 1942 sextet of Bridges, Newhouser, Trout, Trucks, Al Benton and Hal White. All six of those pitchers had 20+ starts, 162+ innings, 2+ WAR and 115+ ERA+. No other staff in baseball history has had that many pitchers reaching that impressive combination. The most recent rotation on the list was the 2006 group of Justin Verlander, Nate Robertson, Jeremy Bonderman and Kenny Rogers. That staff did not have a dominant pitcher, but each of the four accumulated at least three WAR. It's a little surprising that none of the 1980s staffs made the cut. The best 1980s rotation by the stated criteria was the 1980 staff of Dan Schatzeder, Jack Morris, Dan Petry and Milt Wilcox finishing 19th with just 9.4 WAR. The current staff of Verlander, Doug Fister, Max Scherzer and Rick Porcello has the potential to crack the top dozen in the next year or two, but it's not easy to have four pitchers all be successful and stay healthy at the same time. It's happened just once in the last fifty Tigers seasons.